For safe offshore helicopter hoists, wind turbine platforms must be equipped with a helicopter hoist status light (helihoist light) to indicate the status of the hoist. 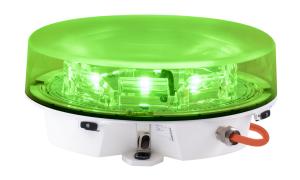 To complement our range of aviation obstruction lights we have, in collaboration with the UK CAA, developed a new status light – the L550-HHS – to facilitate safe helicopter-hoist operations on UK offshore wind turbine platforms. A flashing green light indicates that the wind turbine is preparing to enter safe mode and allow hoisting operations. A steady green signal tells the pilot that the wind turbine is in safe mode and that winching can commence. Why do you need a helihoist light? At Orga, we care about the safety of your operations. Our helihoist light provides pilots with visual confirmation that the wind turbine has been fully shut down and is in safe mode. Our latest offshore platform marking and warning system provides a robust, durable and cost-effective solution for your wind turbine platform. Our new helicopter hoist status light is specially designed to help you meet safety requirements for aids to navigation on offshore installations. It also complies with the CAP437 standard for offshore helicopter landing areas. Orga’s helihoist light combines the benefits of advanced LED technology with optical and system control technologies, to meet the most demanding of applications. In our helihoist light, we offer you an optical design product that throws a highly accurate and uniform light beam. The product is lightweight, easy to install and requires zero maintenance over its service life. To underpin your operational safety, Orga’s L550-HHS is contained in a rugged housing, the design of which is backed up by over 40 years’ experience of designing offshore products. Thanks to our use of the latest technologies, our helihoist light boasts extremely low power consumption. The combination of having a built-in photocell, extremely low wind resistance, built-in monitoring and a long-life power supply that matches its LED life without having to make use of electrolytic capacitors, makes Orga’s helicopter hoist status light the best choice you can make. When it comes to showing the way ahead, Orga is way ahead.